SALEM, Ore. (AP) — With the short 2018 legislative session behind them, Oregon politicians are already looking forward to pushing a cap on greenhouse gas emissions during next year’s long session. After the session ended on Saturday, Senate President Peter Courtney, D-Salem, said at a news conference with Senate Majority Leader Ginny Burdick, D-Portland, that capping carbon emissions will be a priority for the long 2019 legislative session. Gov. Kate Brown expressed confidence legislation to cap carbon emissions and create clean-energy jobs would be realized in 2019. “I anticipate we’ll get this done in 2019,” Brown said at a post-legislative session news conference. Legislation to cap greenhouse gas emissions was among measures that failed this year. Burdick said that was one of her biggest disappointments. “It would have been wonderful to have a miracle happen on the clean energy jobs bill. I always love to see a legislative miracle, and that would have been my No. 1,” Burdick said. Brown said she has obtained funding to staff a policy adviser on the issue and a team to reach consensus between government, business and other stakeholders on the effort to mitigate global warming. The Democratic governor said there is concern among some in the businesses community about the impact. The utility company PGE, for example, feels it would be targeted twice by an emissions cap after being subject to a state law signed in 2016 that will eliminate coal-generated energy in phases through 2030, Brown said. 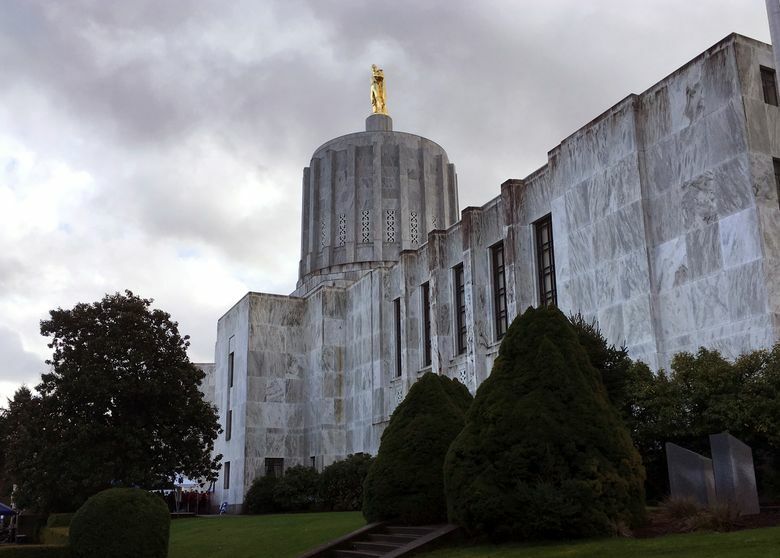 The Oregon Legislature’s 2018 session saw lawmakers pass additional gun controls, an attempt to curb opioid abuse and a remedy to prevent losses to state coffers from the federal tax overhaul. The legislative session, which during even-numbered years can last a maximum of 35 days, started Feb. 5. “We just adjourned, and still I’m not sure how we did it, eight days before our constitutional deadline, eight days, and we passed significant legislation, most of it with bipartisan support,” Courtney said. The federal tax overhaul occupied much of the session, as legislators grappled with how to respond to a loss the overhaul was expected to impose on the state. In response, a pair of bills passed that blocked separate state tax deductions related to the overhaul, one on overseas money, the other on “pass through” income. To become law, Brown must sign the bills. On opioids, the Legislature passed a bill that will require medical practitioners to register with a prescription monitoring program. Lawmakers also passed a gun control measure requested by Brown, closing what she referred to as the “intimate partner loophole.” The bill expands those who can be banned from owning guns and ammunition after a conviction, adding stalking as a qualifying crime and those who are under a restraining order.